Electronic Devices (Conventional Current Version), 10/e, provides a solid foundation in basic analog electronics and a thorough introduction to analog integrated circuits and programmable devices. The text identifies the circuits and components within a system, helping students see how the circuit relates to the overall system function. Full-color photos and illustrations and easy-to-follow worked examples support the text's strong emphasis on real-world application and troubleshooting. Updated throughout, the Tenth Edition features selected circuits keyed to Multisim V14 and LT Spice files so that students learn how to simulate, analyze, and troubleshoot using the latest circuit simulation software. Additionally, an entirely new Chapter 18, “Communication Devices and Methods,” introduces communication devices and systems. Thomas L. Floyd has a Master’s degree in Electrical Engineering (SMU) and Bachelor’s degree in Electrical Engineering (UF). He has worked as a design engineer at Texas Instruments and senior engineer at Martin-Marietta (now Lockheed-Martin). In addition, he has five years’ experience teaching and as department head of the Electrons Technology program at Valencia Community College, Orlando, FL, and five years teaching electronics technology at Mayland Community College, Spruce Pine, NC. 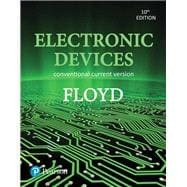 Floyd has been writing textbooks in electronic technology since 1975 including Digital Fundamentals, Principles of Electric Circuits, Electronics Fundamentals, Electronic Devices, Electric Circuit Fundamentals, Digital Fundamentals: A Systems Approach, Digital Fundamentals with PLD Programming, Fundamentals of Analog Circuits: A Systems Approach, Science of Electronics: Digital, Analog Fundamentals, Basic Operational Amplifiers and Linear Integrated Circuits, DC/AC Fundamentals: A Systems Approach, and Renewable Energy Systems.